La Guarida was the first place we added to our Cuba itinerary. Food lovers as we are, we couldn’t miss this restaurant in the middle of Old Havana. We booked a couple of weeks in advance for lunch so we could get the opportunity to take some photos with day light. The rain didn’t stop us from climbing to the terrace and enjoying the views over the city. Even up there we didn’t have any silence, the noises of the city are currently everywhere around Havana. The only time the city wasn’t in a rush was here when we woke up early to explore this square. Returning to La Guarida, it’s difficult to find the right words to describe this restaurant. First of all, it is the favorite place of several celebrities in the city, it was the stage of the production of Rihanna cover for Vanity Fair and the food is amazing. 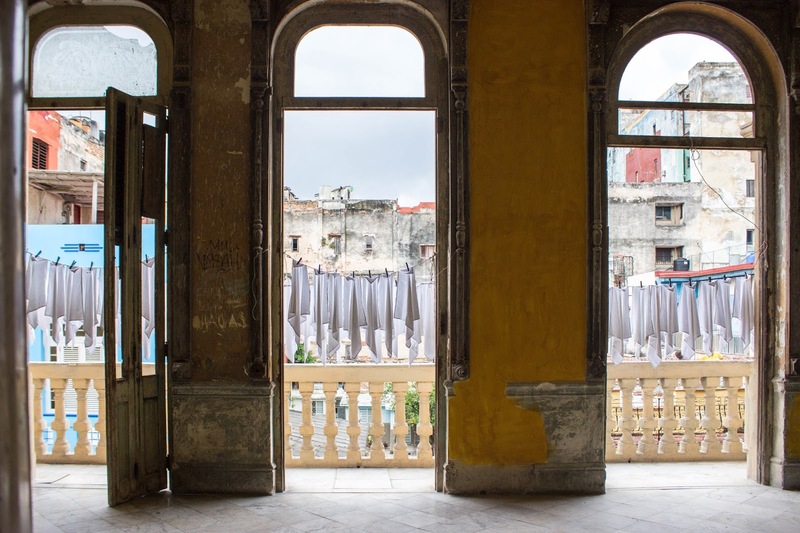 It’s located on the second floor of an early 20th century building where on the first floor you can see the towels and napkins drying along with the restoration works taking place in the space. I would say it would be a shame if you are in the city and you don’t try La Guarida, but if you can’t get a reservation, you can still visit the place and go up to the terrace. La Guarida foi o primeiro local que adicionamos ao nosso roteiro de Cuba. Amantes de comida como somos, não podiamos deixar escapar este restaurante no meio de Havana Velha. Reservamos com algumas semanas de antecêndia para a hora de almoço para conseguirmos tirar algumas fotografias por lá durante o dia. A chuva não nos impediu de subir até ao terraço e aproveitar as vistas sobre a cidade. Mesmo lá em cima não há sossego, os ruídos da cidade são presença assídua em qualquer parte de Havana. O único momento em que a cidade não estava em reboliço foi aqui, quando acordamos bem cedo para explorar a praça. Voltando ao La Guarida, é difícil encontrar as palavras certas para descrever este restaurante. Primeiro de tudo, é o local predilecto de várias celebridades na cidade, foi o palco da produção de Rihanna para a Vanity Fair e comida é muitooooo boa. Fica localizado no segundo piso de um edifício do início do século 20, onde no primeiro piso podem ver as toalhas e guardanapos a secar juntamente com as obras de restauro a decorrer no espaço. Diria que seria uma pena não experimentarem o La Guarida, mas se não conseguirem reserva, passem pelo espaço só para admirar o local e subir ao terraço. You must be <a href="https://ararapintada.com/wp-login.php?redirect_to=https%3A%2F%2Fararapintada.com%2F2017%2F07%2Fla-guarida-cuba%2F">logged in</a> to post a comment.